Well it appears that spring might be well and truly underway. After last weekend's miserable weather of cold wet rain (although, I've never seen dry rain), this weekend the sun began to break through. Which was helpful, because I could go off to look for adders (yes, snakes, and poisonous ones too!) which was rained off the week before. I met up with my two other volunteers (Graham and Lee) for the mission near Woodbridge at 9am with printed transect in hand. The sun was desperately trying to break through the clouds and each time it did so, we could feel its warmth through the slightly chilly breeze reminding us of winters weak, fading grip. Off we went with binoculars scanning all the likely spots of dead bracken in sunny spots and sunny spots under trees. Being reptiles, snakes cannot generate their own heat like us humans, so the first job of the day for any snake is to find a nice, undisturbed, sunny spot to warm up the blood so you can move around with ease. On our transect, I could hear a Skylark singing up above me in the sky. However, like all Skylarks, they're never really that easy to spot. Could I add it to my list if I've only heard it? Hmmm, tricky one. Then a passing cloud omitted the sun and I quickly looked up through the bins to see if I could spot it, and by an amazing chance of luck, I found it almost straight away! So Skylark comes in at 99, but what would be my first 100th species??? Well, we were 3/4 of the way around the site without seeing anything, we then came across a patch of dense heather which we thought wouldn't be suitable for adders, but Graham thought he would have a little look on the off chance whilst me and Lee skirted around the edge. Graham, not seeing anything and thinking it was a pointless excursion going into the heather, thought he'd come back and join us. It was then he turned and saw coiled up on some bright green moss in an opening an adder. He quietly got our attention and we quietly went trampling through the heather to join him. We had to be very careful because snakes are very sensitive to vibration and sound and can slink off very quickly if disturbed. Please note, they WON'T chase you and bite you, they're very scared of you, you're very big and especially if you're a human, cumbersome. We got there to see the little fellow all coiled up, but it was obvious he was quite aware of us standing about 10 metres away and I managed to get a shot (picture) of it as it turned and slunk off back into the heather. It was the only one we saw that day, but we were happy to have seen him and grateful to Graham's sense of trying something different. 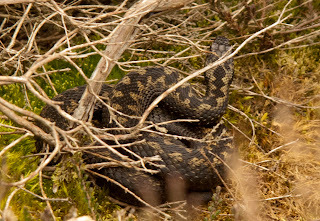 Male adder making good his escape. 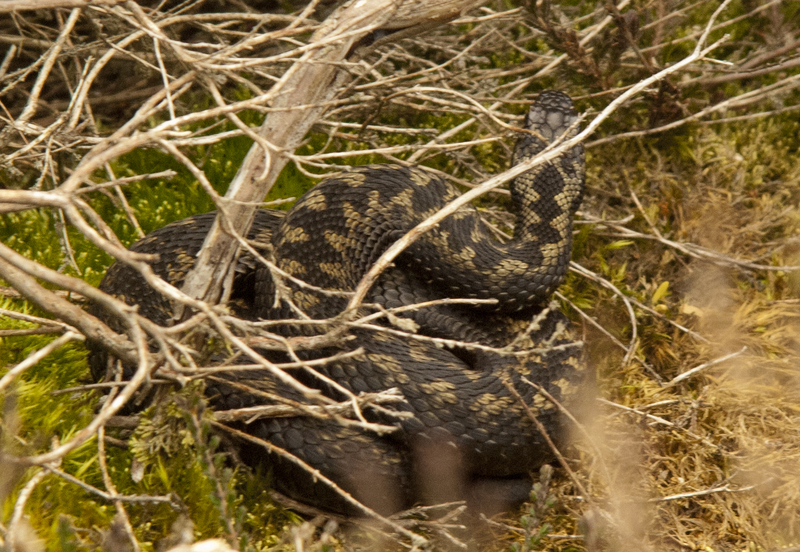 Getting home from the adder survey, it was back to the domestic chores of the weekend. I had to pop down the shed to have a little tidy up from when the bats were there during winter. When I looked up I saw something that immediately said "Yay, species 100!". Obviously, the creature didn't say that or it really would have been a special moment. 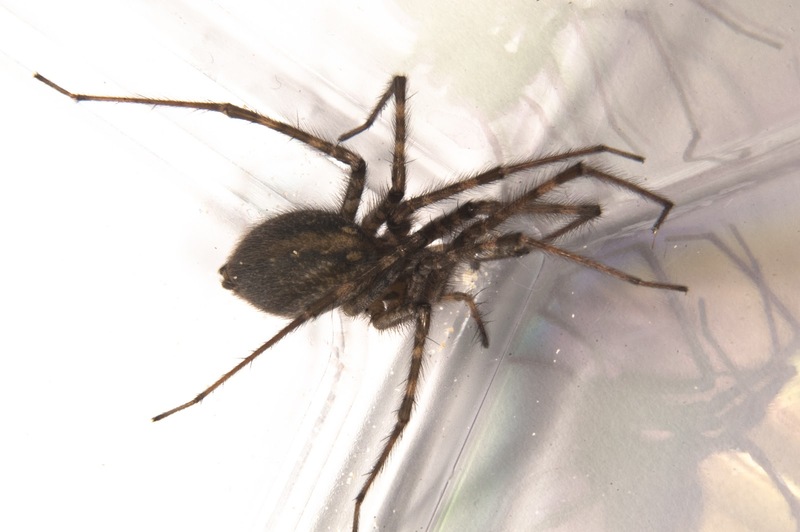 The creature in question is a spider, but not any old spider, it was one of our biggest (if not the biggest) spiders. Don't worry, I'll put the photo at the end of the blog so those of a nervous disposition can actually read my blog. Both of its names (common and scientific) are in themselves enough to scare. The Giant House Spider or Tegenaria gigantea, say it all really and after much fighting with the huge beastie, I managed to get it back into my broom cupboard office for a photoshoot. I was also warned by the wifey (an arachnophobic) that if I let it escape, I WILL NOT be sleeping, eating or anythinging until it has been captured and sent packing. So alas, the photos were of it in a large pot and not running freely around my desk. Some people just don't understand. The evening came and after such a lovely day, it was time to get the moth trap out. I had managed to purchase another white sheet from the local charity shop allowing me to place a sheet beneath the trap and attach a sheet to the fence nearby, thus hopefully attracting more. Someone once said (and I don't think it was a rugby player) "Build it and the will come." and come they did. In the morning I actually run out of sample pots and I still wasn't half way through them. The other half had to remain in the covered and sheltered trap until I had ID'd the first lot and placed them into bigger containers in the fridge before I could collect the rest. There was one anomaly which I had often read, but still didn't expect to see it. A Bumblebee, a Forest Cuckoo Bumblebee to bee exact (sorry). It was a little bit peeved and wasn't really up for some photos, so I let it off to begin it's glorious sunny morning looking for flowers. Then there was the other anomaly, which I've had before and didn't surprise me, an Ichneumon wasp, again, very peeved and released early. 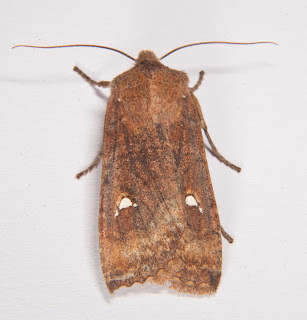 Everything else was a moth however and much time was spent trying to sort them all out. Unfortunately, wifey had a bad night and really wasn't feeling well so she couldn't help me. There were some that I've had before, but there were 10 others that were new to me and my list! First out were a beautiful pair of Oak Beauty's Biston strataria. Quite a size, in fact the biggest I've caught so far, with a lovely pattern and beautiful feathered antennae. Detail showing the lovely feathered antennae. 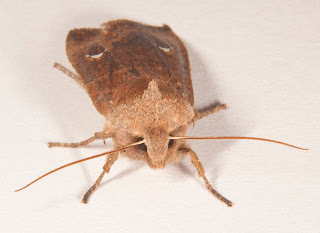 What I thought was a White Point Mythinma albipuncta turned out to be a Satellite Eupsilia transversa, (thanks Angela). 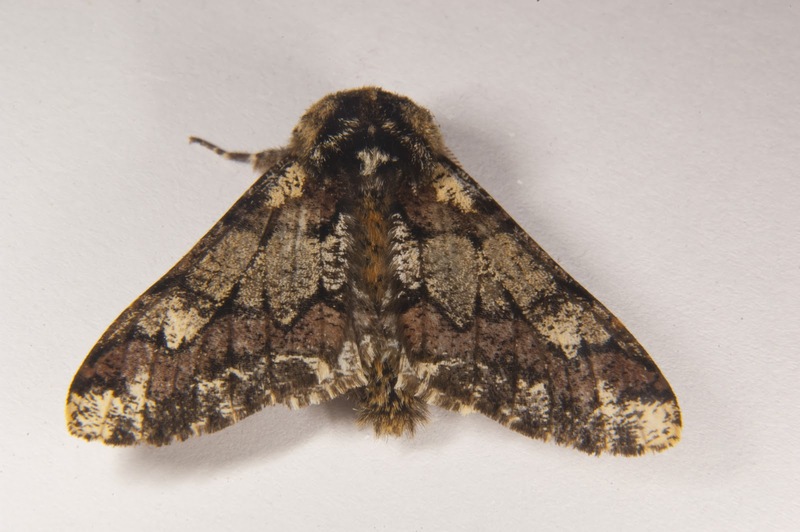 I've also added a picture to show the difference in antennae compared to the Oak Beauty above. 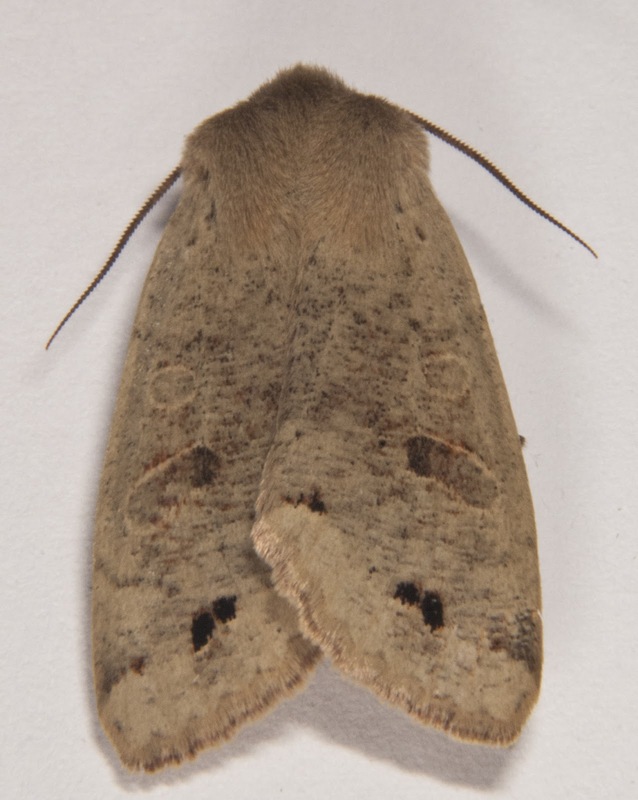 M albipuncta showing a different sort of antennae. Another new one was a plume moth Emmelina monodactyla which I'm unable to bring you a photo of as I couldn't get a decent photo. But the season is early and I'm sure they'll be plenty more who are more photogenic. Another new quaker came to the trap in the form of the Twin Spot Quaker O munda. 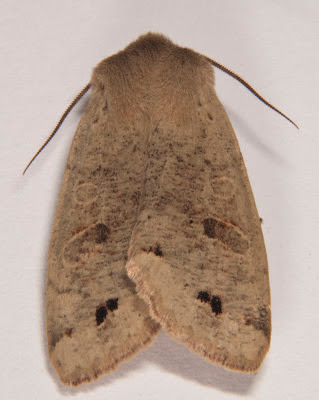 Twin Spot Quaker O munda. Another new a delightful addition to the list was one of the last out of the trap, Pine Beauty Panolis flammea. Such a fantastic pattern and the feeling of achievement when you actually ID something yourself. 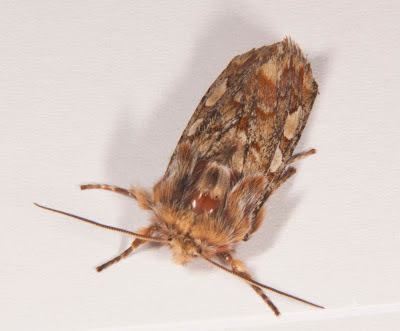 Usually the moth gods of twitter Sarah @landguardranger, Barry @forelander, Moth Whispers @mothwhispers, Les @dorsetmoths and Angela @Aojandthehounds help ID the harder moths for me. Thanks guys. camouflage against a pine tree. So after going through all the moths it was time for a count up. But it doesn't stop there! Oh no, I put some of the first moths into the insect box I have on my fence so they could while away the day in complete safety. I then noticed among the mass of 7 spot ladybirds basking on the vegetation below, that there was another type of bright red beetle also basking. 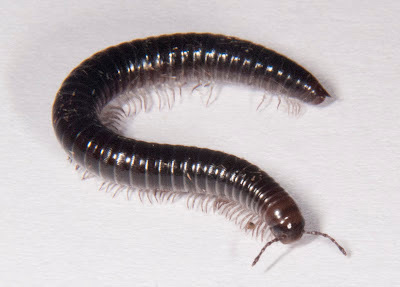 I went to grab it but it fell down into the leaf litter, not to let it go I delved into the leaf litter and came across something completely different, a Black Millipede Tachypodioulus niger, also known as the White-legged Snake Millipede (shows the importance of scientific names). T niger, not a red beetle. After the photoshoot and ID'ing I went to put him/her back to the same place he was found and there siting on the plant above was the original little red beetle I was after in the first place. 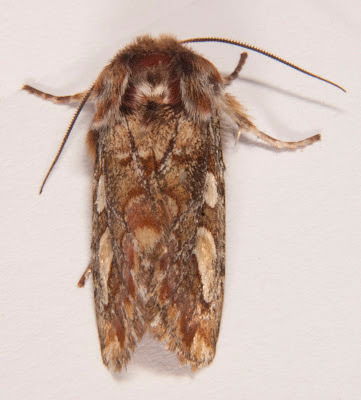 It didn't get away a second time and was successfully identified and photographed. 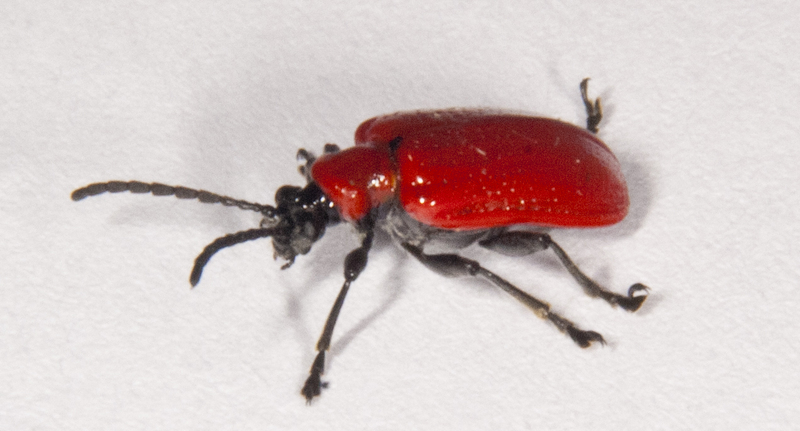 So ladies and gentlemen, I give you the Lily Beetle Lilioceris lilii. Now before you get to the very end I'll just say here's the list. Now you were warned in the beginning that I would warn you when the scary eight legged picture would come, well here's your warning, ARACHNOPHOBES LOOK AWAY NOW!!!!!!!! Tegenaria gigantea. This spider was at least 5cm across.